In the realm of Kanye fandom, I’m something like a veteran. I’ve followed his turbulent career closely for a long time, since way back when he was still running around in Polo shirts and backpacks – the walking image of a hip-hop overachiever. And yet, I can honestly say that the first news of his new album threw me off my balance. I didn’t really get it. When the title was revealed, it made me cringe, as I suspect it did a lot of people. My Beautiful Dark Twisted Fantasy – it’s so unwieldy and indulgent (something about those three adjectives); it doesn’t exactly roll off the tongue. Later, when the weekly leak series G.O.O.D. Friday was inaugurated, I fretted over the messy spontaneity of the new songs like a worrisome mother: concerned that the unruly apples would spoil an otherwise meticulously pored-over and refined bunch.Color me surprised, then, that having now played the album on repeat for several days, in a variety of settings and through myriad moods, I find myself concluding that it meets, and ultimately surpasses, near anything he’s ever done – treasured and celebrated as that catalogue is. 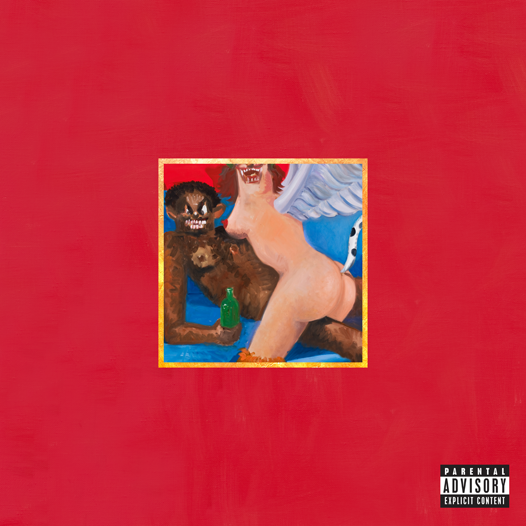 I think it achieves this unlikely feat via a simple truth that seems obvious in hindsight: compared with My Beautiful Dark Twisted Fantasy, Kanye’s previous works seem largely soft, sugary and naive.